Seven Signs of Nursing Home Abuse and Neglect | Hupy and Abraham, S.C. Nursing homes serve an important purpose by caring for those who can no longer care for themselves. While there are many assisted living facilities doing an admirable job, the ones that don't are putting their residents, and potentially your loved one, at risk. 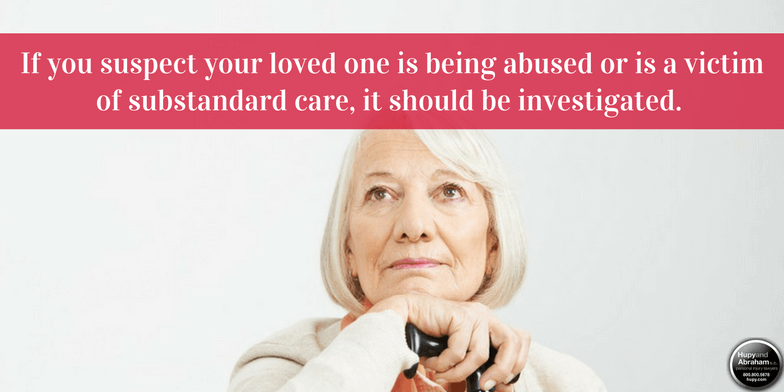 If you suspect your loved one is being abused or is a victim of substandard care, it should be investigated. Remember, abuse and neglect aren't confined to the nursing home. In-home caretakers are also responsible for the well-being of those they serve. Abuse and neglect can also occur in any type of assisted living facility. If you are seeking more information about nursing home abuse or neglect, Hupy and Abraham has many resources available on our website. We have also developed a Guide for Nursing Home Abuse and Neglect Victims that you can download here for free. If you suspect that your loved one has been a victim of nursing home neglect and abuse, call the personal injury attorneys of Hupy and Abraham at 800-800-5678 for a confidential, free consultation.